Saturday 28th September from 10:30am to 4:30pm. Children (under 11 if accompanied) FREE, Children (11 to 16) £3. Everyone is welcome - we are disabled friendly. Car parking is free. Refreshments and light lunches available. Large outdoor picnic area. The 2019 show will feature 15+ layouts of various scales, some of which are focused on younger visitors including the chance to drive gigantic Thomas and Percy; along with a number of supporting trade stands - which we hope will appeal to you and your modelling needs. You may even get to pick up a bargain or track down that long lost but wanted item. Exhibits are in various locations - the ground floor of the Museum, in the new exhibition hall, Copelands Room, and in the railway carriage clubhouse. We are based at the Whitewebbs Museum of Transport which is situated within easy reach of Junction 25 on the M25. From the A10, turn right into Bullsmoor Lane. At the T-junction, turn right, follow the road round into Whitewebbs Lane for 1.7 miles. The museum is on the left at the far end of this road, 150 yards before the next T-junction. Car parking is free. By rail the nearest station is Crews Hill (approx. 1 mile away) with trains from Finsbury Park/Moorgate/Hertford North. Phone Brian on 01992 761127 or Les on 07798 765859. About Us - you are welcome to come and visit! The Enfield Whitewebbs Railway Modellers are based at the Whitewebbs Museum of Transport in Crews Hill and have been meeting regularly since the 1980's. 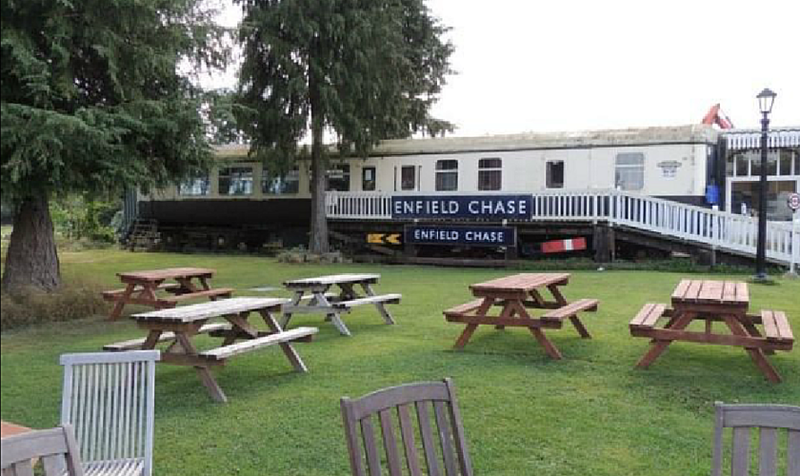 The club was originally based at the Enfield Royal Small Arms Factory and in the early 2000's moved to the museum and its unique clubhouse BR Mk2 Brake Carriage No. 977767 located in the museum grounds. Whitewebbs Park (OO gauge), main club layout - a large city layout depicting a two track upper level suburban line and station, and a four track lower level heavy freight and express passenger lines. Recently enhanced with lighting, fully automatic signalling and a new warehouse goods yard. Currently under construction (want to help?) and coming in over 20ft long its based on a terminus station allowing for the use of 3 trains at the same time. 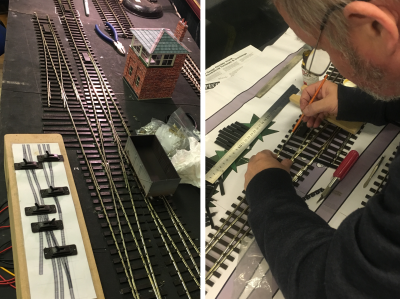 We have now finished building base boards; now the track and wiring is being installed. We hope to have "something" running on here soon. 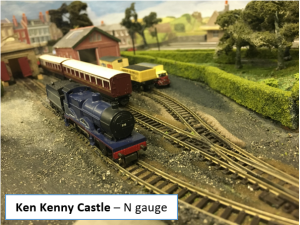 Ken Kenny Castle (N gauge), recently refurbished - originally donated to the club in 2017 and extensively refreshed and updated with a new look, scenics and a castle. You are welcome to come and "drive" this layout. 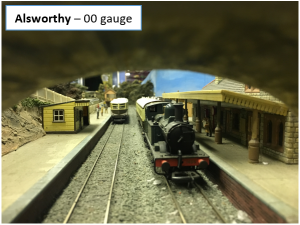 Alsworthy (OO gauge), member owned - an inspired 1930's branch line terminus generated from various locations in the Oxfordshire area showcasing GWR design and architecture. Local passenger and good services run from the quaint setting at Alsworthy Terminus over the rambling river Flatt, past the flight locks on the canal into Alston Station, where it disappears through the tunnel towards Oxford. You can see our layouts when you visit the Museum - the railway carriage clubhouse is usually open when the museum is open and you can see our layouts in action. Generally the Museum is open every Tuesday between 10:00 a.m. and 4:00 p.m. (last entry at 3:30 p.m.) and the last Sunday of each month (with some exceptions around events). Find out more on the Museum website. We meet every Tuesday 10am to 4pm and Thursday 8pm to 10pm in our unique clubhouse (the railways carriage). New members are always welcome - if you have an interest in railways and/or modelling then why not come and join us? We are always looking for new people to join - and no previous experience is nessesary! There are around 20 members of the club and we have interests in G, O, OO and N gauge layouts and the club holds a wide selection of stock available for running (playing with). Just come along on say "Hello" and we'll give you a cup of tea or coffee too! Membership is just £20 per year and there are no weekly attendance fees. We hope you can come and join us and enjoy the fun and passion of trains and creating new model worlds, you are also welcome to bring along your own stock to run on our layouts. © Copyright 2016-2018 Enfield Whitewebbs Railway Modellers. Which is part of the Whitewebbs Museum of Transport. Owned and managed by The Enfield and District Veteran Vehicles Trust, registered charity number 275684.